Allison has a radiography background, specialising in Ultrasound. She joined City University London in 2009 as a part-time lecturer and Clinical Co-ordinator for the Ultrasound programme. Allison has worked in many Hospitals in London and Essex and still works clinically in the private sector in Essex. Allison initially worked at Colchester Hospital and studied at Ipswich School of Radiography. After qualifying she moved to the Royal London Hospital, but left to train as a sonographer at St Georges' Hospital. After qualifying and working in Kent she returned to London, working at St Thomas' Hospital, whilst there she continued her education by taking the HDCR at the Royal Free School of Radiography. 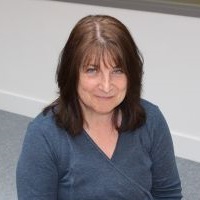 Since that time she has worked as a sonographer in all clinical areas with training responsibilities for student sonographers since 1995 until 2009 across two Essex Hospitals during this time she successfully campaigned for the recognition of the sonographers as Advanced Practitioners. She is the clinical co-ordinator for the ultrasound programme and leads the Gynae Module. - Springfield Medical Centre, Chelmsford Gynaecology, Subfertility, Early pregnancy, Abdominal and MSK Ultrasound for OCS Ltd.
Allison is currently looking at the forces used to grip the ultrasound probe and how this can be reduced to improve the ergonomics of scanning. Harrison, G. and Harris, A. (2015). Work-related musculoskeletal disorders in ultrasound: Can you reduce risk? Ultrasound, 23(4), pp. 224–230. doi:10.1177/1742271X15593575 . Harris, A. and Harrison, G. (2018). How to be a good mentor and provide useful feedback. British Medical Ultrasound conference 4-6 December, Manchester. Harris, A. and Harrison, G. (2017). Games with Aims. HEA Annual Conference 2017 Generation TEF: Teaching in the spotlight 4 July, Manchester, UK. Harris, A. (2015). Case Presentation: LUTS in a 74 year old woman. British Medical Ultrasound 9-11 December, Cardiff. Harris, A. Image Interpretation - Obstetric Ultrasound: Head and Brain. e-learning. e-learning for healthcare / Health Education England. 01 Sep 2013 (Internet publication). Harrison, G., Harris, A. and Flinton, D. (2018). Can Teaching Ultrasound Ergonomics to Ultrasound Practitioners Reduce White Knuckles and Transducer Grip Force? Journal of Diagnostic Medical Sonography, 34(5), pp. 321–327. doi:10.1177/8756479318758324 . Harris, A., Harrison, G. and Flinton, D. (2018). Can Teaching Ultrasound Ergonomics to Ultrasound Practitioners Reduce White Knuckles and Transducer Grip Force? Journal of Diagnostic Medical Sonography, 34(5), pp. 321–327. doi:10.1177/87564793187583 . Harrison, G. and Harris, A. (2014). Postgraduate Medical Ultrasound Programme: Have we Flipped? Learning at City Journal, 4(2), pp. 25–38. Harrison, G., Mulloy, B., Harris, A. and Flinton, D. (2012). On-line case discussion assessment in ultrasound: The effect on student centred and inter-professional learning. Radiography, 18(3), pp. 160–165. doi:10.1016/j.radi.2012.03.003 . Harrison, G. and Harris, A. Games with Aims. HEA Annual Conference 2017 Generation TEF: Teaching in the spotlight., 2017. Harrison, G. and Harris, A. Games with Aims. Achieving Excellence in Radiography Education and Research Conference, 2016. Postgraduate ultrasound programme: we've flipped, have you? HEA Conference. Glasgow (2016). LUTS in a 74year old woman. BMUS Conference, Cardiff (2015). Description: A case study presentation on a late presentation of cervical cancer; the ultrasound appearances and correlation with the follow up MRI images. Does the grip pressure used to hold an ultrasound probe change after training with an ergometer? A pilot study. BMUS, Manchester (2014). Ergonomics Workshop. BMUS, Manchester (2014). Prolapsed Pedunculated Fibroid. Telford, England (2012). Short Cervix at the Anomaly scan. Telford, England (2012). Patchwork Assessment in Ultrasound: Introduction of Another Patch. Help or Hindrance? London (2010). Teaching the skills needed for breaking bad news in ultrasound. City University London. (2010).